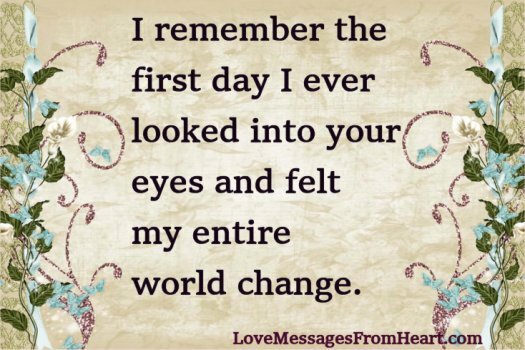 I remember the first day I ever looked into your eyes and felt my entire world change. The first time I saw you was like magic … I knew you would be the love of my life. From the very moment I first saw you, something changed in my heart. It grew into the love I feel for you. The first day when I saw you and we started talking was the first day I really felt alive … and it has been better and better since. I love you. I never believed in love at first sight until the day I saw you. The fist day I met you and all the days after until my last one: it is all about You. It might be a cliche, but I have loved ever since the first day I saw you.